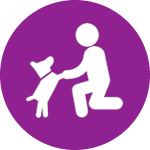 Become a Foster for a dog in need. Volunteer your time and give happiness! Find and adopt your new best friend! Come and meet some of our rescued dogs at one of our many adoption events, and find a friend! 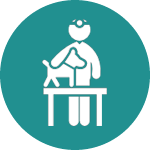 Rescue One assists with free vaccination clinics, spay/neuter assistance, and emergency pet food. Join us at one of our community fundraising events and help support Rescue One! Fiona came to us very emaciated after being dumped by Fellows Lake. 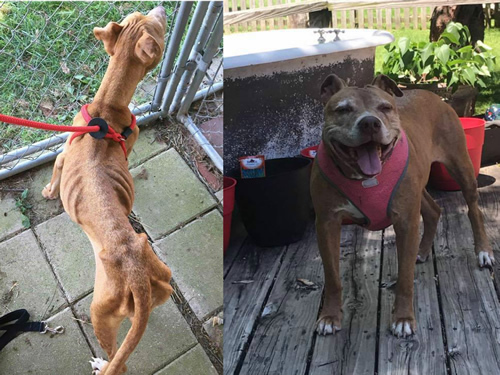 Despite her starvation, Fiona was a very sweet dog, with a pleasant temperament toward people. 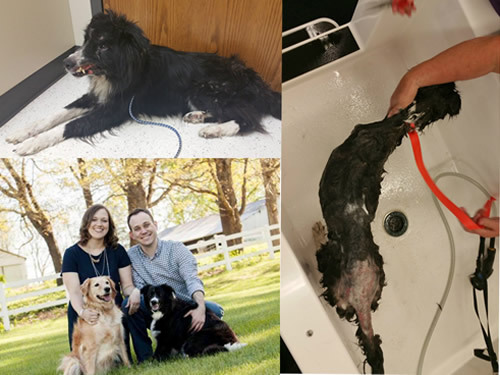 Fiona was in no shape to be adopted out, but thanks to the many generous donors who contributed supplies and medical care, she regained her proper weight and we could begin the process of finding her a forever home. Months later she found the perfect home. Finally, she is a happy dog and has a human who loves her. 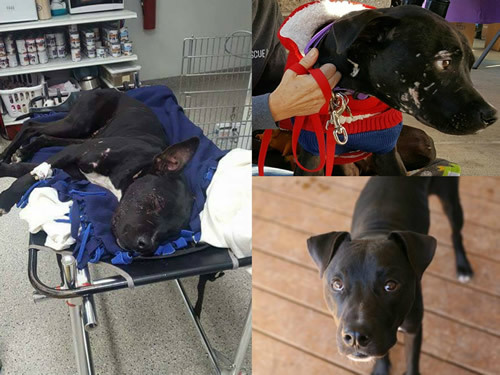 Sweet Harlow was found after being shot point blank in the head. She was rushed to the vet where she had to have surgery to remove her eye and bone fragments from her jaw. She bounced back in no time and found her forever home! Hervil was found in the woods by hikers. He had been shot in the head, so they immediately contacted Rescue One for help. The bullet was lodged in his nasal cavity and had to be surgically removed. After a couple of months of healing, he found a wonderful forever home! When Ingrid was rescued, she was in terrible shape. She had an injury to her mouth that was very infected, as well as infected ears and skin. She was also over 20 lbs underweight. She appeared to have given up hope. Over the next several months and with aggressive treatment, she began to blossom! 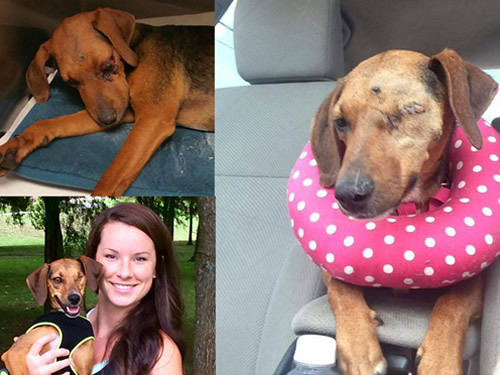 While her muzzle is permanently disfigured, she found her forever home and is very loved! Jetta came to Rescue One with 7 other dogs. 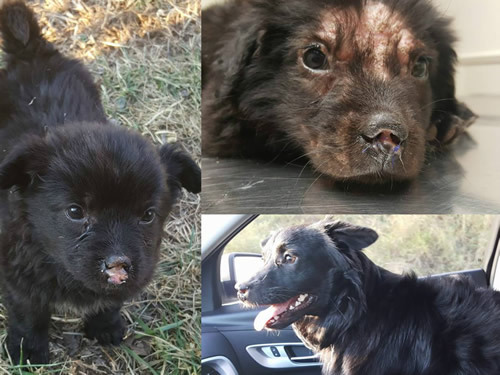 She was only a couple of months old, and had a terrible injury to her nose and severe mange. 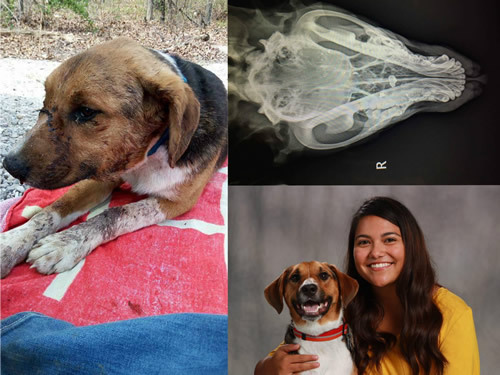 She had to have surgery to be able to breathe out of her nose, and it healed wonderfully! 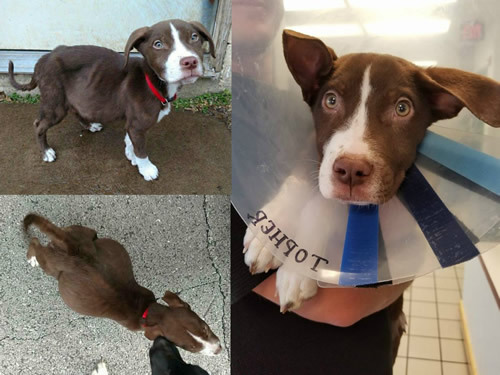 Her skin healed as well, and shortly after that she found her forever home! Lindy was spotted by someone driving down the road; they could see her ribs from their car. 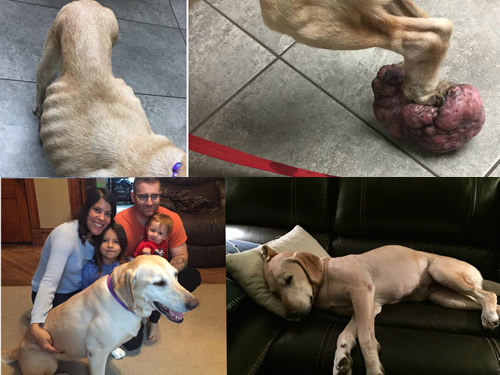 She had a massive tumor on her back left leg that totally encased her foot. Dr. Katie Loula of Christian County vet clinic removed the 2½ lb. tumor, plus a couple of toes. In no time at all, Lindy was walking around without any issues. The hair has all grown back and you can’t even tell that she’s missing a few toes. She put on 15 pounds on in one month, making those ribs disappear. She was adopted by a family with children and now is living the dream in a suburb of Denver with a family that loves her very much! One of our volunteers shared Morgan’s story. She had been in a shelter in rural Arkansas for over 4 years. After seeing her face, we could not turn away from helping her. 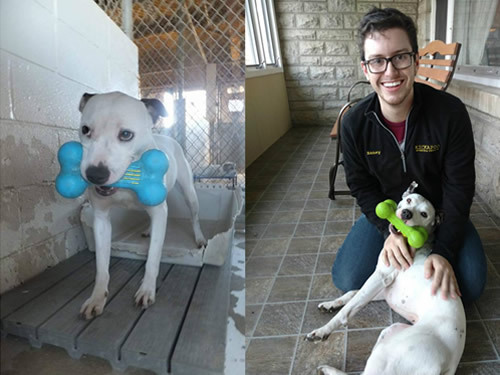 Our volunteers drove the 3 hours to get her, and after being in our care for 3 months, she found her forever home! Topher was found after being dumped in the trash. His stomach was very enlarged, and several liters of fluid had to be drained from his stomach. He was sent to the MU Vet Hospital where he was diagnosed with Cor Triatriatum Dexter, which is a very rare birth defect. He had corrective surgery and is looking forward to living long and happy life! Zander was rescued in Stone County. It would have been impossible to count all of the punctures on his poor body. Some of his teeth had been pulled, which is not uncommon in bait dogs. He also had a fractured scapula and broken ribs. He was hospitalized for over a week and was unable to get up for 5 days. After several months of rest and love, he recovered! He is a wonderful, loving dog. PLEASE HELP FIND US HOMES! Don't fall victim to BDS (black dog syndrome)! Black dog syndrome is a phenomenon in which black dogs and cats are passed over for adoption and spend more time in rescue or shelters. Don't overlook these awesome dogs! Click individual pictures to find out more about each pet. See all of our available pets are rescueonespringfield.com. Today, “Nina” lived her last day on a chain. She is 10 years old and after having a spa day and a pup cone, she is ready for a soft, comfy bed in her foster home. Welcome to the good life, sweet girl! Hello! I am Leroy Jethro Gibbs but everyone calls me Gibbs. I am a 5 year old 80 pound lap dog. Actually, I am a Walker Coonhound mix. I get along well with other dogs and people plus I am very gentle with the little ones. Please no cats! They say that I am trained in basic commands and crate trained. I am learning to not pull on a leash. I am a FUN dog looking for a FUN family. I love road trips, hiking, camping and running. I also love to just chill around the house and get some loving. I hope that you have a big fence because well, I am a big dog. P.S. If you have other dogs I love to play with them too. My adoption fee is $150 and includes my spay/neuter, vaccinations, wellness exam, heartworm test, and microchip! If you're interested in meeting/adopting me, please visit rescueonespringfield.com/adoption-application/ and fill out the form! We do adopt out of state with vet references and video home check. Thank you O’Reilly & Wooten Families for being the presenting sponsor for the 2nd Annual Rescue One Canine Classic Golf Tournament! You can still sign up your team or to sponsor at https://rescueonespringfield.com/canine-classic/! "Oh, my love, my darling...I've hungered for your touch..." Melody is my name and now that I've joined this Rescue One club "Unchained Melody" is my new favorite jam. See, I spent the first 3 years of my life on a chain, but now, I'm free and soaking up every moment! I am a beautiful 56lb., female, boxer mix who is on the hunt to find my own darling family. I am good with other dogs, cats, and I ADORE children. I am house trained, crate trained, and doing so well with my leash training. I know some basic commands like "sit" and "shake," but I'm working on learning more. I am enthusiastic, fun, goofy, and playful so I want a 6ft privacy fence in my new home. 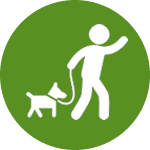 But, I could also do well in an apartment as long as my person took me on some fun walks and trips to the park. I also nap like a pro and love being with my buds. I fall head over heels for my people quickly. What can I say? I'm just full of love to give! I'm so happy cuddled up beside you...just heaven! I cannot get enough of your attention, but I've got to make up for those 3 years I missed out on all this good stuff! Have you fallen in love with this beautiful Melody? My adoption fee is $150 and includes my spay/neuter, vaccinations, wellness exam, heartworm test, and microchip! If you're interested in meeting/adopting me, please visit www.rescueonespringfield.com/our-adoption-process/adoption-application/ and fill out the form! We do adopt out of state with vet references and video home check.